In my opinion, this book wasn't as good as his first one, The Tipping Point. Got a little slow in the middle, which is why I've stopped reading it in the middle. Having already read the Tipping Point, I was not quite as taken with this book in part because the novelty to Gladwell's writing style was not as strong. Still, I found the book to be more interesting than I thought it would be. The lessons are a bit esoteric, but valid. It would be interesting to compare and contracts, and even meld, the conclusions of this book with those of Thinking, Fast & Slow. Might make sense to purchase a summary of the book for your files. Kudos to Malcolm and the crew. This book, though wandering and irresolute in its presentation, was a fascinating read. I really enjoyed the stories and examples, notwithstanding their occasional irrelevancy. 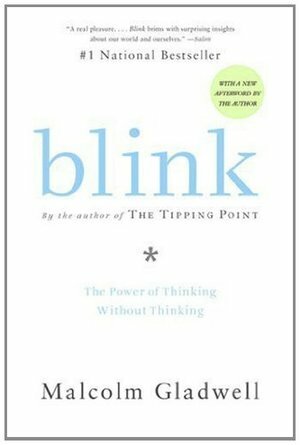 Blink is so much better than the Tipping Point. In summary, Gladwell is saying we make split decisions, which are often accurate. Our split decisions also often aren't accurate. Some people make split decisions better than others... in some instances. You can train yourself to make better split decisions... sometimes. This book will give you lots to think about. I'm not sure of the veracity of all of his claims, but it's still a worthwhile read.